We hope is to provide that unique, elegant, creative, thoughtful, and surprising gift idea for men with these vast choices of gift ideas. You can find antique, vintage, and modern pieces in watches, porcelain, ties, clothing, tobacco and sports collectibles, figurines, tins, messenger bags, and so much more. Hobby, lifestyle type, current wish lists of the men in your life should not consist of hours spend in different stores when you can find that exciting item right here. Vintage Scrimshaw belt buckle with Pheasants. England Official Football shirt 2007-2009, sz XL. 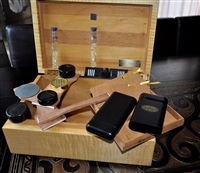 SAGE HUMIDOR wooden, huge cigar storage box with extras.